TOUR GUIDE RESPONSE: Dear Walt and dear Mickey, i highly appreciate your kind gesture to give me so high rate. It was much thank your good attitude to my work and attention and your patience. You are always welcome for new visits in future. Prosperity to your family. Awesome 5 days around Kazan. Marat is knowledgeable, accommodating and proud. TOUR GUIDE RESPONSE: Dear Alejandro, best greetings from Kazan to you and Gilbert. Those days with you and Gilbert were more holidays than work. My sincere wishes of health and wealth to you both and your families ! Marat is an outstanding guide and a better person. Goes beyond expectations, very proud of his Tatar origin and very knowledgeable. Highly recommend Marat! Very informative, interesting tour of the Kremlin, mosque and church with lots of local insight and fascinating historical background. Would definitely try another of his tours on our next visit. TOUR GUIDE RESPONSE: Dear Susan, You are welcome ! TOUR GUIDE RESPONSE: Thank you a lot, Alisa. TOUR GUIDE RESPONSE: Thank You, dear Deborah, and also thanks to all of your friends for attentive listening to my stories about Kazan and Tatarstan. With the best wishes, Marat. TOUR GUIDE RESPONSE: Vielen Danke, Luzia. Es war sehr angenehm Ihnen in Kazan sehen und Raifa zu zeigen. We really liked Marat. We booked two tours with him, which is a risk not knowing anything about him, but we were sure glad we did. He's friendly, knowledgable, and certainly makes one feel comfortable. He really gave us a positive impression of the people and culture of Kazan and Tatarstan. So thank you Marat, and Tours by Locals, for a memorable experience. Marat was very easy to work with and very accommodating of our wishes, schedule and budget. His enthusiasm for his city was unparalleled. The tour was excellent. TOUR GUIDE RESPONSE: Thank you Jennifer for such a warm compliment. Did you manage to solve what you had asked me about ? This is a great tour to take to see the countryside outside of Kazan. Marat is a great guide with good insight to the area. Marat was excellent. He had a very broad knowledge of the history of Kazan and was able to delve into details as needed. 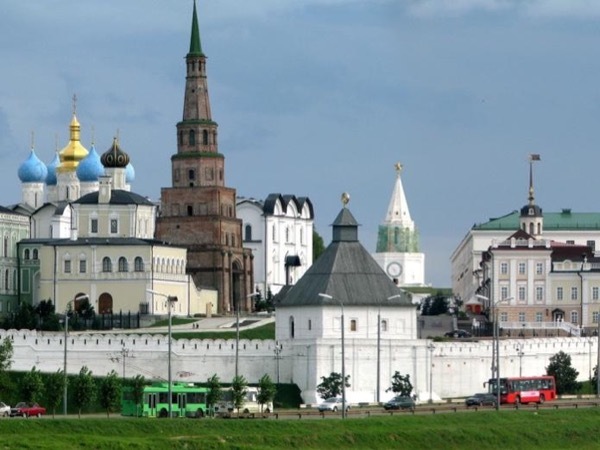 His descriptions and explanations helped us to appreciate Kazan's history and the sites that we visited in a way that would not have been possible otherwise. He made Kazan most enjoyable for us. TOUR GUIDE RESPONSE: Dear Kulathida, thank You a lot for Your positive impressions of Kazan and Your kind comments about my service. I highly appreciated the rating you have shown. I was very enjoyed to meet You and Your beautiful daughter in Kazan. Let all Your new travelling destinations be more interesting and successful. My sincerest and warmest wishes of happyness to You and Your daughter! Best regards from Kazan! Marat brought me to Raifa Monastry and on the way talked about the history of Kazan and all the events that have taken place there. The Monastry was a place of peace and was beautiful in the snow. Marat was on time and picked me up from my hotel and he drove me to the monastry. He is a excellent guide and i would strongly recommend him to anyone who wants to learn more about Kazan. Thank you Marat for showing me Kazan. You made my trip and i will never forget the beautiful sights i saw. TOUR GUIDE RESPONSE: Thank You Mr. O'Sullivan, it was much thank to your kind nature I felt easy rendering this tour and was pleased to find a new friend. My deepest respect and appreciation for your choosing my service.